Happy New Year 2015!!! Our apologies for the radio silence over the holidays. Every year we venture back east, braving the frigid cold to spend time with family and friends, causing our content to suffer (not to mention our health). But this time also provides us with the opportunity to reflect on all of the deliciousness we have been privileged to enjoy over the year. 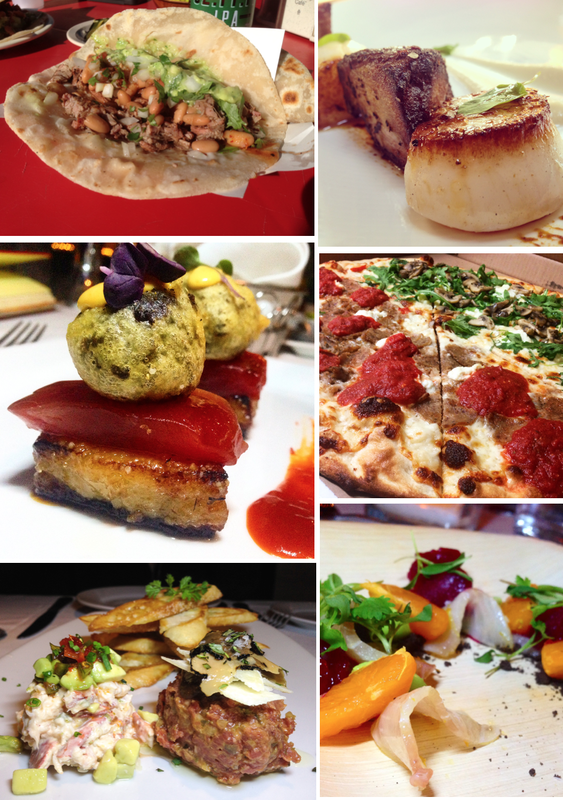 So without further ado, we present to you SanDiegoVille's Best Bites of 2014. Better late than never! Grande Especial from Don Chido in the Gaslamp - Made for 4 or 6 people, this monstrous amount of food comes on a huge cutting board and includes wood fire grilled skirt steak, wood fire grilled wild Mexican mojo shrimp, carnitas, a roasted 1/2 chicken with mole sauce, sautéed market greens with Gualillo and anejo cheese, guacamole, house salsas, mexican rice, frijoles refritos, Pico de gallo and as many fresh tortillas as your heart desires. Make a resolution to treat yourself right this new year, and head to Don Chido with some meat-loving friends for this amazing smorgasbord of awesome from Chef Antonio Friscia. Disclaimer - Make sure your group is ready to eat. Four large dudes had trouble putting down all this food. Lobster and Beef Tartare from Eddie V's at The Headquarters - Surf and turf - the perfect choice for the indecisive ones who want the best of both worlds. Start with the lobster and beef tartare at Eddie V's and enjoy two mounds of nirvana. The first is a rich, truffled steak topped with a generous portion of shaved black truffle and sliced parmesan. The other, a refreshing serving of big chunks of lobster topped with avocado, peppers and chives. Each are amazing on their own, but mix 'em up atop a slice of toasted baguette and you have sheer bliss. Visit Eddie V's during their daily happy hour when this dish is an insane value at $10 for the same serving. Pork Belly and Scallop Appetizer from Table No. 10 in the East Village - We've returned to Table No. 10 just for this dish, and we will again and again - seared scallops and pork belly, served with sunchoke puree, coconut cream and a natural reduction. Get all the ingredients in one bite for music in your mouth. Head to the up-and-coming East Village and enjoy this fantastic plate by Chef Jason Gethin. You won't be disappointed. Ricotta Gnudi from Tidal at Paradise Point Resort & Spa - Gnudi is gnocchi filled with cheese. Why it's not the most popular pasta in the world, I will never know. Chef Amy DiBiase stuffs gnudi with ricotta cheese, and tops this nearly unknown pasta with roasted eggplant, zucchini, tomato, braised lamb and black olive. Head to this beautiful, waterside restaurant and taste for yourself. Ahi/Pork Belly/Black Garlic Tempura Stack at Top of the Market, Downtown - This dish consists of Fijian ahi yellowtail sashimi atop brown sugar and garlic-roasted pork belly, capped off with a black garlic tempura ball. Just by the description of ingredients, you can tell its a winner. Chef Ivan Flowers blew us away with this diverse stack of perfection. It's something that you'll wish you could savor for hours then dream about for many nights after. Call and make sure it's available, because it's served as a special. Apple and Boysenberry Pie from Mom's in Julian - Aside from my grandmother's and mother's, this is the best pie I've ever had. We were lucky enough to be in Julian early enough to avoid the ever-present line at Mom's Pies, Etc., but it's worth the wait regardless. Just look at it - oozing with love! Crispy Rock Shrimp from TJ Oyster Bar in Bonita - So, now there are three TJ Oyster Bars! We just wish at least one of them was closer. Regardless, we venture down to Bonita frequently for the amazing service and delicious eats at #2. We're still exploring the menu, but on our most recent visit, we sampled the rock shrimp and it was muy delicioso! Be ready to munch, because it's a huge plate of food. Taco Perrone from Tacos el Yaqui in Rosarito, Mexico - Located on a side street in Rosarito, this small, al fresco taco shop always has a line and features about 5 menu items, although they need only one. The Taco Perrone is consistently better than my fondest memories of its indulgence. It seems simple enough - a cook sits out front making carne asada all day on a small, wood burning grill, which eventually goes into some kind of sauce or broth in a stew pot. Place your order and a hot tortilla filled with melted cotija cheese (like a quesadilla) comes off the griddle, is peeled open and topped with the chopped steak. Then, it's topped with pinto beans, guacamole and an onion and cilantro mix. Roasted jalapeños and radishes are brought table-side for garnish. We've taken the 45 minute trek to Rosarito on a whim just for this taco. It may be the best ever. Feel free to bring your own beer (see that Stone Enjoy By IPA in the photo?)! Thai Red Snapper from Table No. 10 in the East Village - Table No. 10 wowed us big time on our first visit, so much so that it has two items on our annual Best Bites list. Our mouths watered as our server poured Manilla clam curry broth over a plate of crispy red snapper. The combination of succulent flavors added by the fish, clams, melted leeks, sea beans and red curry screamed with flavor. We've heard this item is no longer on the menu so we'll stop here so as not to further entice you. Sorry. Meatball and Ricotta Pizza from Landini's in Little Italy - In 2014, Landini's took over as our go-to spot for pizza. We have no complaints on any pie we've ordered, but it's the meatball and ricotta pie that keeps us coming back. Thin slices of meatball, mounds of ricotta cheese and globs of some of the finest red sauce we've had at any pizzeria make this quite possibly the top pizza in all the city. Cobia from Chef Ryan Carson at Dinner Lab Pop Up Supper Club - We were lucky enough to attend the inaugural Dinner Lab event in San Diego. One of our first courses was this denatured cobia (citrus juice cooked, like ceviche) with avocado, cilantro micro greens, tangerine, frozen beet and a crispy cocoa powder. It was amazing, unlike anything I've ever eaten. Harmonious. Glorious. Absolute culinary artistry. 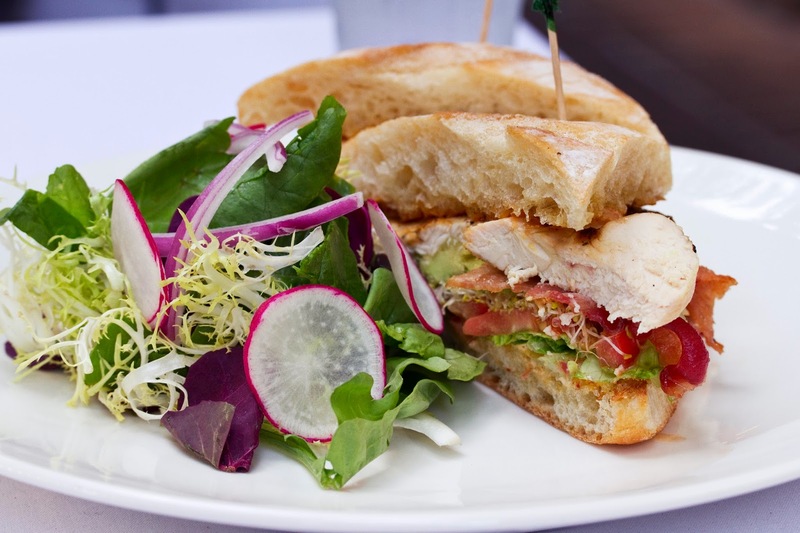 Chicken Club Sandwich from Currant American Brasserie in Downtown San Diego - It was a stressful day and I was trying to grab a quick lunch before a meeting. This sandwich from Currant at the Sophia Hotel calmed me down and made all my worries slip away. The bread was warm and soft, the chicken moist and juicy and the bacon was exactly as it should be. Everything about it was great. Nothing earth shattering, just an amazing sandwich using simple flavors.